Titus (/ˈtaɪtəs/; Latin: Titus Flavius Caesar Vespasianus Augustus;[a] 30 December 39 AD – 13 September 81 AD) was Roman emperor from 79 to 81. A member of the Flavian dynasty, Titus succeeded his father Vespasian upon his death, thus becoming the first Roman emperor to come to the throne after his own biological father. From c. 57 to 59 he was a military tribune in Germania. He also served in Britannia, perhaps arriving c. 60 with reinforcements needed after the revolt of Boudica. In c. 63 he returned to Rome and married Arrecina Tertulla, daughter of Marcus Arrecinus Clemens, a former Prefect of the Praetorian Guard. She died c. 65. Titus never remarried. He appears to have had multiple daughters, at least one of them by Marcia Furnilla. The only one known to have survived to adulthood was Julia Flavia, perhaps Titus's child by Arrecina, whose mother was also named Julia. During this period Titus also practiced law and attained the rank of quaestor. The history of the war was covered in detail by the Roman-Jewish historian Josephus in his work The War of the Jews. Josephus served as a commander in the city of Yodfat when the Roman army invaded Galilee in 67. After an exhausting siege which lasted 47 days, the city fell, with an estimated 40,000 killed. Titus, however, was not simply set on ending the war. Meanwhile, the Jews had become embroiled in a civil war of their own, splitting the resistance in Jerusalem among several factions. The Sicarii, led by Menahem ben Judah, could hold on for long; the Zealots, led by Eleazar ben Simon, eventually fell under the command of the Galilean leader John of Gush Halav; and the other northern rebel commander, Simon Bar Giora, managed to gain leadership over the Idumeans. Titus besieged Jerusalem. 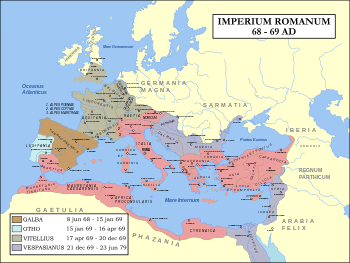 The Roman army was joined by the Twelfth Legion, which had been previously defeated under Cestius Gallus, and from Alexandria, Vespasian sent Tiberius Julius Alexander, governor of Egypt, to act as Titus' second in command. The Romans finally captured the Antonia Fortress and began a frontal assault on the gates of the Temple. 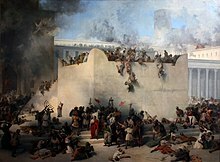 As they breached the gate, the Romans set the upper and lower city aflame, culminating with the destruction of the Second Temple. When the fires subsided, Titus gave the order to destroy the remainder of the city, allegedly intending that no one would remember the name Jerusalem. The Temple was demolished, after which Titus' soldiers proclaimed him imperator in honor of the victory. Jerusalem was sacked and much of the population killed or dispersed. Josephus claims that 1,100,000 people were killed during the siege, of which a majority were Jewish. Josephus' death toll assumptions are rejected as impossible by modern scholarship, since around the time about a million people lived in Palestine, about half of them were Jews, and sizable Jewish populations remained in the area after the war was over, even in the hard-hit region of Judea. 97,000 were captured and enslaved, including Simon Bar-Giora and John of Jish. Many fled to areas around the Mediterranean Sea. Titus reportedly refused to accept a wreath of victory, as he claimed that he had not won the victory on his own, but had been the vehicle through which their God had manifested his wrath against his people. Upon his arrival in Rome in 71, Titus was awarded a triumph. Accompanied by Vespasian and Domitian, Titus rode into the city, enthusiastically saluted by the Roman populace and preceded by a lavish parade containing treasures and captives from the war. Josephus describes a procession with large amounts of gold and silver carried along the route, followed by elaborate re-enactments of the war, Jewish prisoners, and finally the treasures taken from the Temple of Jerusalem, including the Menorah and the Pentateuch. Simon Bar Giora was executed in the Forum, after which the procession closed with religious sacrifices at the Temple of Jupiter. The triumphal Arch of Titus, which stands at one entrance to the Forum, memorializes the victory of Titus. With Vespasian declared emperor, Titus and his brother Domitian received the title of Caesar from the Senate. In addition to sharing tribunician power with his father, Titus held seven consulships during Vespasian's reign and acted as his secretary, appearing in the Senate on his behalf. More crucially, he was appointed Praetorian prefect (commander of the Praetorian Guard), ensuring the Guard's loyalty to the Emperor and further solidifying Vespasian's position as a legitimate ruler. In this capacity Titus achieved considerable notoriety in Rome for his violent actions, frequently ordering the execution of suspected traitors on the spot. When in 79, a plot by Aulus Caecina Alienus and Eprius Marcellus to overthrow Vespasian was uncovered, Titus invited Alienus to dinner and ordered him to be stabbed before he had even left the room. During the Jewish wars, Titus had begun a love affair with Berenice, sister of Agrippa II. The Herodians had collaborated with the Romans during the rebellion, and Berenice herself had supported Vespasian in his campaign to become emperor. In 75, she returned to Titus and openly lived with him in the palace as his promised wife. The Romans were wary of the eastern queen and disapproved of their relationship. When the pair was publicly denounced by Cynics in the theatre, Titus caved in to the pressure and sent her away, but his reputation suffered further regardless. Vespasian died of an infection on 23 June 79 AD, and was immediately succeeded by his son Titus. As Pharaoh of Egypt, Titus adopted the titulary Autokrator Titos Kaisaros Hununefer Benermerut (“Emperor Titus Caesar, the perfect and popular youth”). Because of his many (alleged) vices, many Romans feared that he would be another Nero. Against these expectations, however, Titus proved to be an effective Emperor and was well loved by the population, who praised him highly when they found that he possessed the greatest virtues instead of vices. Although his administration was marked by a relative absence of major military or political conflicts, Titus faced a number of major disasters during his brief reign. On 24 October 79, four months after his accession, Mount Vesuvius erupted. The eruption almost completely destroyed the cities and resort communities around the Bay of Naples. 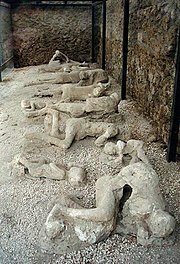 The cities of Pompeii and Herculaneum were buried under metres of stone and lava, killing thousands. Titus appointed two ex-consuls to organize and coordinate the relief effort, while personally donating large amounts of money from the imperial treasury to aid the victims of the volcano. Additionally, he visited Pompeii once after the eruption and again the following year. Meanwhile, war had resumed in Britannia, where Gnaeus Julius Agricola pushed further into Caledonia and managed to establish several forts there. As a result of his actions, Titus received the title of Imperator for the fifteenth time, between September 9 and December 31, 79 AD. The Babylonian Talmud (Gittin 56b) attributes Titus's death to an insect that flew into his nose and picked at his brain for seven years, in a repetition of another legend referring to the biblical King Nimrod. Jewish folklore says that Titus was plagued by God for destroying the second Temple Mount and a gnat went up his nose and he had a large growth inside of his brain that killed him. ^ Suetonius claims Titus was born in the year Caligula was assassinated, 41. However, this contradicts his statement that Titus died in his 42nd year, as well as Cassius Dio, who notes that Titus was 39 at the time of his accession. See Suetonius, The Lives of Twelve Caesars, Life of Titus 1, 11; Cassius Dio, Roman History LXVI.18; and Brian Jones; Robert Milns (2002). Suetonius: The Flavian Emperors: A Historical Commentary. London: Bristol Classical Press. p. 91. ISBN 978-1-85399-613-9. ^ Jones and Milns, pp. 96, 167. ^ Sulpicius Severus, Chronicles II.30.6–7. For Tacitus as the source, see T.D. Barnes (July 1977). "The Fragments of Tacitus' Histories". Classical Philology. 72 (3): 224–231, pp. 226–228. doi:10.1086/366355. ^ Schwartz, Seth (1984). "Political, social and economic life in the land of Israel". In Davies, William David; Finkelstein, Louis; Katz, Steven T. (eds.). The Cambridge History of Judaism: Volume 4, The Late Roman-Rabbinic Period. Cambridge University Press. p. 24. ISBN 9780521772488. ^ "Titus". The Royal Titulary of Ancient Egypt. Retrieved 13 March 2018. ^ The exact number of casualties is unknown; however, estimates of the population of Pompeii range between 10,000 ( "Engineering of Pompeii: Ruins Reveal Roman Technology for Construction, Transportation, and Water Distribution". Archived from the original on 8 July 2008. Retrieved 10 March 2009. ) and 25,000 (), with at least a thousand bodies currently recovered in and around the city ruins. ^ Sanford, Eva Matthews (1937). "Nero and the East". Harvard Studies in Classical Philology. 48: 75–103. doi:10.2307/310691. JSTOR 310691. ^ Roth, Leland M. (1993). Understanding Architecture: Its Elements, History and Meaning (First ed.). Boulder, CO: Westview Press. ISBN 978-0-06-430158-9. ^ Claridge, Amanda (1998). Rome: An Oxford Archaeological Guide (First ed.). Oxford, UK: Oxford University Press, 1998. pp. 276–282. ISBN 978-0-19-288003-1. ^ Coins bearing the inscription Divus Vespasianus were not issued until 80 or 81 by Titus. ^ "Tractate Gittin 56b". www.sefaria.org.il. ^ Quinn, Thomas (Director) (June 26, 1995). Urban Legends: Season 3 Episode 1 [Television series]. United States. FilmRise. ^ "Titus's Death". Chabad.org. Retrieved 8 November 2018. ^ The Destruction of Pompeii, 79 AD, Translation of Pliny's letters. Original. ^ Ehrman and Pleše (2011), p. 523. "Titus, Flavius Sabinus Vespasianus" . Encyclopædia Britannica. 26 (11th ed.). 1911. p. 1032.